James Cohan Gallery is pleased to present the second solo exhibition of photographs by Wim Wenders, from his series Pictures From the Surface of the Earth. 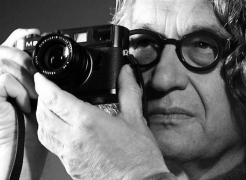 This exhibition focuses on Wenders' panoramas-some which measure up to fifteen feet long-from his extensive travels to Australia and Japan. Wenders' photographs act as archaeological dioramas, recording a specific moment in the life of a place. Each photograph tells not one, but many poignant stories; the transience of being, the antithesis of city and desert, the earth absent of urban civilization. 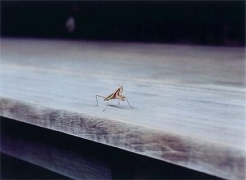 Wenders' photographs of Australia and Japan appear to stand in stark contrast to one another –the unforgiving harshness of the Australian Outback as opposed to the serene lushness of the Japanese bamboo forest. However, Wenders ingeniously brings to light their commonality; both are deserted and devoid of the human figure. Traces of civilization, such as weathered writing carved onto the face of a boulder, an endless dirt road to nowhere, a centuries old sculpture covered by soot, all speak of an urban presence long abandoned and inevitably reclaimed by nature. 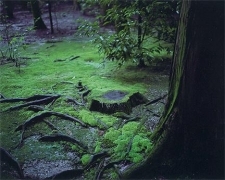 An anonymous path through the immense green thicket in Bamboo Forest, Nara, Japan, 2000 or a tree stump overgrown by verdant moss in Mossy Ground, Nara, Japan 2000 remind us of the human presence that once was. For Wenders, the urban and natural are inexorably linked. The urban desert, one created by the relics of civilization, is a constant theme in Wenders' photographs, as in Beetle Cemetery, Coober Pedy, South Australia, 1988, where an automobile junkyard becomes a desert-scape, with hollow shells of demolished cars creating artificial land formations. In this context, the waste of humanity is transformed. 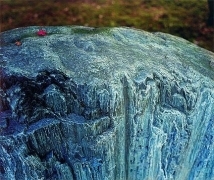 "Pictures from the Surface of the Earth", a book of Wenders' photographs, was published in 2001. A museum exhibition of the same name has traveled to Hamburger Bahnhof, Berlin, The Guggenheim Museum, Bilbao, The Museum of Contemporary Art, Sydney and the City Art Gallery, Wellington, New Zealand.